Southwest Airlines provides the best customer experience, according to the results of a new study from the Temkin Group. The study, called the 2012 Temkin Experience Ratings, included a wide range of industries. Earlier this week we reported on the results of their study in the retailing category. Sam’s Club topped the list of retailers, followed by Amazon.com and Target. Today we are looking at their airline category. In the study, 10,000 US consumers were polled last month (January, 2012) and asked about their experiences with different companies. The questions included whether certain companies met their needs, how easy it was to use the company to accomplish what they wanted to do, and how they felt about their interactions with each company. In the airline category, Southwest was ranked the highest, with a score of 73%. It was the only airline whose score fell within the ‘good’ range. No airline scored in the ‘excellent’ range. AirTran was ranked 2nd. It had a score of 68%, which falls in the ‘okay’ range. JetBlue placed 3rd, with 65%. 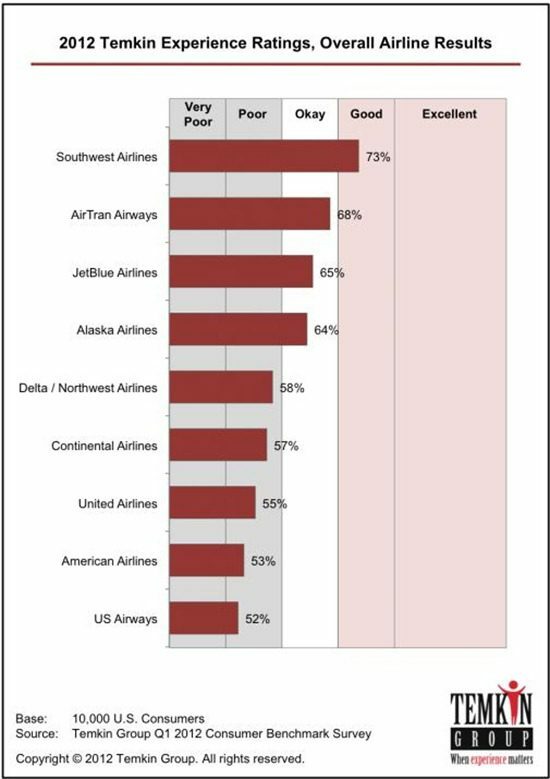 Of the nine airlines ranked, the bottom five, Delta/Northwest, Continental, United,American, and US Airways, fell into the ‘poor’ range. The full scorecard is posted below, courtesy Temkin.